A 19th-century Hindu temple in Khajuraho India, incorporating a Hindu spire, a Jain cupola, a Buddhist stupa and a Muslim style dome, in place of the usual shikharas. Secularism in India means equal treatment of all religions by the state. Unlike the Western concept of secularism which envisions a separation of religion and state, the concept of secularism in India envisions acceptance of religious laws as binding on the state, and equal participation of state in different religions. With the 42nd Amendment of the Constitution of India enacted in 1976, the Preamble to the Constitution asserted that India is a secular nation. However, neither India's constitution nor its laws define the relationship between religion and state. The laws implicitly require the state and its institutions to recognize and accept all religions, enforce religious laws instead of parliamentary laws, and respect pluralism. India does not have an official state religion. The people of India have freedom of religion, and the state treats all individuals as equal citizens regardless of their religion. In matters of law in modern India, however, the applicable code of law is unequal, and India's personal laws - on matters such as marriage, divorce, inheritance, alimony - varies with an individual's religion. Muslim Indians have Sharia-based Muslim Personal Law, while Hindus, Christians, Sikhs and other non-Muslim Indians live under common law. The attempt to respect unequal, religious law has created a number of issues in India such as acceptability of child marriage, polygamy, unequal inheritance rights, extrajudicial unilateral divorce rights favorable to some males, and conflicting interpretations of religious books. Secularism as practiced in India, with its marked differences with Western practice of secularism, is a controversial topic in India. Supporters of the Indian concept of secularism claim it respects Muslim men’s religious rights and recognizes that they are culturally different from Indians of other religions. Supporters of this form of secularism claim that any attempt to introduce a uniform civil code, that is equal laws for every citizen irrespective of his or her religion, would impose majoritarian Hindu sensibilities and ideals, something that is unacceptable to Muslim Indians. Opponents argue that India's acceptance of Sharia and religious laws violates the principle of equal human rights, discriminates against Muslim women, allows unelected religious personalities to interpret religious laws, and creates plurality of unequal citizenship; they suggest India should move towards separating religion and state. Secularism is a divisive, politically charged topic in India. Ellora caves, a world heritage site, are in the Indian state of Maharashtra. The 35 caves were carved into the vertical face of the Charanandri hills between the 5th and 10th centuries. The 12 Buddhist caves, 17 Hindu caves and 5 Jain caves, built in proximity, suggest religious co-existence and secular sentiments for diversity prevalent during pre-Islamic period of Indian history. Indian religions are known to have co-existed and evolved together for many centuries before the arrival of Islam in the 12th century, followed by Mughal and colonial era. Ashoka about 2200 years ago, Harsha about 1400 years ago accepted and patronized different religions. The people in ancient South Asia had freedom of religion, and the state granted citizenship to each individual regardless of whether someone’s religion was Hinduism, Buddhism, Jainism or any other. 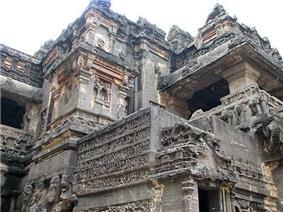 Ellora cave temples built next to each other between 5th and 10th centuries, for example, shows a coexistence of religions and a spirit of acceptance of different faiths. There should not be honour of one’s own (religious) sect and condemnation of others without any grounds. This approach to interfaith relations changed with the arrival of Islam and establishment of Delhi Sultanate in North India by the 12th century, followed by Deccan Sultanate in Central India. The political doctrines of Islam, as well as its religious views were at odds with doctrines of Hinduism, Buddhism and other Indian religions. New temples and monasteries were not allowed. As with Levant, Southeast Europe and Spain, Islamic rulers in India treated Hindus as dhimmis in exchange of annual payment of jizya taxes, in a sharia-based state jurisprudence. With the arrival of Mughal era, Sharia was imposed with continued zeal, with Akbar - the Mughal Emperor - as the first significant exception. Akbar sought to fuse ideas, professed equality between Islam and other religions of India, forbade forced conversions to Islam, abolished religion-based discriminatory jizya taxes, and welcomed building of Hindu temples. However, the descendants of Akbar, particularly Aurangzeb, reverted to treating Islam as the primary state religion, destruction of temples, and reimposed religion-based discriminatory jizya taxes. Akbar's tomb at Sikandra, near Agra India. Akbar's instruction for his mausoleum was that it incorporate elements from different religions including Islam and Hinduism. After Aurangzeb, India came into control of East India Company and the British Raj. The colonial administrators did not separate religion from state, but marked the end of unequal hierarchy between Islam and Hinduism, and reintroduced the notion of equality before the law for Hindus, Christians and Muslims. The British Empire sought commerce and trade, with a policy of neutrality to all of India’s diverse religions. By the mid-19th century, the British Raj administered India, in matters related to marriage, inheritance of property and divorces, according to personal laws based on each Indian subject’s religion, according to interpretations of respective religious documents by Islamic jurists, Hindu pandits and other religious scholars. In 1864, the Raj eliminated all religious jurists, pandits and scholars because the interpretations of the same verse or religious document varied, the scholars and jurists disagreed with each other, and the process of justice had become inconsistent and suspiciously corrupt. The late 19th century marked the arrival of Anglo-Hindu and Anglo-Muslim personal laws, where the governance did not separate the state and religion, but continued to differentiate and administer people based on their personal religion. The British Raj provided the Indian Christians, Indian Zoroastrians and others with their own personal laws, such as the Indian Succession Act of 1850, Special Marriage Act of 1872 and other laws that were similar to Common Laws in Europe. In the first half of 20th century, the British Raj faced increasing amounts of social activism for self-rule by a disparate groups such as those led by Hindu Gandhi and Muslim Jinnah; the colonial administration, under pressure, enacted a number of laws before India’s independence in 1947, that continue to be the laws of India in 2013. One such law enacted during the colonial era was the 1937 Indian Muslim Personal Law (Shariat) Application Act, which instead of separating state and religion for Western secularism, did the reverse. It, along with additional laws such as Dissolution of Muslim Marriages Act of 1939 that followed, established the principle that religious laws of Indian Muslims can be their personal laws. It also set the precedent that religious law, such as sharia, can overlap and supersede common and civil laws, that elected legislators may not revise or enact laws that supersede religious laws, that people of one nation need not live under the same laws, and that law enforcement process for different individuals shall depend on their religion. The Indian Muslim Personal Law (Shariat) Application Act of 1937 continues to be the law of land of modern India for Indian Muslims, while parliament-based, non-religious uniform civil code passed in mid-1950s applies to Indians who are Hindus (which includes Buddhists, Jains, Sikhs, Parsees), as well as to Indian Christians and Jews. The 7th schedule of Indian constitution places religious institutions, charities and trusts into so-called Concurrent List, which means that both the central government of India, and various state governments in India can make their own laws about religious institutions, charities and trusts. If there is a conflict between central government enacted law and state government law, then the central government law prevails. This principle of overlap, rather than separation of religion and state in India was further recognized in a series of constitutional amendments starting with Article 290 in 1956, to the addition of word ‘secular’ to the Preamble of Indian Constitution in 1975. 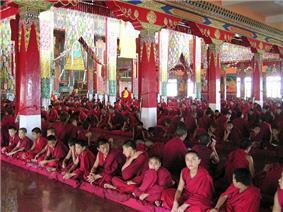 Buddhist monks at the Sera Monastery during a festival. The monastery was granted asylum by India and relocated to Mysore after the Chinese invasion of Tibet. The overlap of religion and state, through Concurrent List structure, has given various religions in India, state support to religious schools and personal laws. This state intervention while resonant with the dictates of each religion, are unequal and conflicting. For example, a 1951 Religious and Charitable Endowment Indian law allows state governments to forcibly take over, own and operate Hindu temples, and collect revenue from offerings and redistribute that revenue to any non-temple purposes including maintenance of religious institutions opposed to the temple; Indian law also allows Islamic religious schools to receive partial financial support from state and central government of India, to offer religious indoctrination, if the school agrees that the student has an option to opt out from religious indoctrination if he or she so asks, and that the school will not discriminate any student based on religion, race or other grounds. Educational institutions wholly owned and operated by government may not impart religious indoctrination, but religious sects and endowments may open their own school, impart religious indoctrination and have a right to partial state financial assistance. In matters of personal law, such as acceptable age of marriage for girls, female circumcision, polygamy, divorce and inheritance, Indian law permits each religious group to implement their religious law if the religion so dictates, otherwise the state laws apply. In terms of religions of India with significant populations, only Islam has religious laws in form of sharia which India allows as Muslim Personal Law. Secularism in India, thus, does not mean separation of religion from state. Instead, secularism in India means a state that is neutral to all religious groups. Religious laws in personal domain, particularly for Muslim Indians, supersede parliamentary laws in India; and currently, in some situations such as religious indoctrination schools the state partially finances certain religious schools. These differences have led a number of scholars to declare that India is not a secular state, as the word secularism is widely understood in the West and elsewhere; rather it is a strategy for political goals in a nation with a complex history, and one that achieves the opposite of its stated intentions. In the West, the word secular implies three things: freedom of religion, equal citizenship to each citizen regardless of his or her religion, and the separation of religion and state. One of the core principles in the constitution of Western democracies has been this separation, with the state asserting its political authority in matters of law, while accepting every individual’s right to pursue his or her own religion and the right of religion to shape its own concepts of spirituality. Everyone is equal under law, and subject to the same laws irrespective of his or her religion, in the West. In contrast, in India, the word secular does not imply separation of religion and state. It means equal treatment of all religions. Religion in India continues to assert its political authority in matters of personal law. The applicable personal law differ if an individual’s religion is Islam, Christianity, or Hindu. For example, the minimum age of marriage for girls is 18 for Hindu and Christian Indians, while the personal law according to sharia allows Muslim Indians to marry a girl less than 12 years old. Over the last 40 years, All India Muslim Personal Law Board and other Muslim civil organizations have actively opposed India-wide laws and enforcement action against child marriages; they have argued that Indian Muslims have a religious right to marry a girl when her age is below 18, even 12. In Western secular countries, age of consent and age of marriage are derived from secular laws, not religious laws. The term secularism in India also differs from the French concept for secularity, namely laïcité. While the French concept demands absence of governmental institutions in religion, as well as absence of religion in governmental institutions and schools; the Indian concept, in contrast, provides financial support to religious schools and accepts religious law over governmental institutions. The Indian structure has created incentives for various religious denominations to start and maintain schools, impart religious education, and receive partial but significant financial support from the Indian government. Similarly, Indian government financially supports, regulates and administers the Wakf council (Islam), historic Hindu temples, Buddhist monasteries, and certain Christian religious institutions; this direct Indian government involvement in various religions is markedly different from Western secularism. Indian concept of secularism, where religious laws supersede state laws and the state is expected to even handedly involve itself in religion, is a controversial subject. Any attempts and demand by Indian Hindus to a uniform civil code is considered a threat to their right to religious personal laws by Indian Muslims. In 1978, the Shah Bano case brought the secularism debate along with a demand for uniform civil code in India to the forefront. Shah Bano was a 62 year old Muslim Indian who was divorced by her husband of 44 years in 1978. Indian Muslim Personal Law required her husband to pay no alimony. Shah Bano sued for regular maintenance payments under Section 125 of the Indian law. Shah Bano won her case, as well appeals to the highest court. Along with alimony, the Chief Justice of the Supreme Court of India wrote in his opinion just how unfairly Islamic personal laws treated women and thus how necessary it was for the nation to adopt a Uniform Civil Code. The Chief Justice further ruled that no authoritative text of Islam forbade the payment of regular maintenance to ex-wives. The Shah Bano ruling immediately triggered a controversy and mass demonstrations by Muslim men. The Islamic Clergy and the Muslim Personal Law Board of India, argued against the ruling. Shortly after the Supreme Court’s ruling, the Indian government with Rajiv Gandhi as Prime Minister, enacted a new law which deprived all Muslim women, and only Muslim women, of the right of maintenance guaranteed to women of Hindu, Christian, Parsees, Jews and other religions. Indian Muslims consider the new 1986 law, which selectively exempts them from maintenance payment to ex-wife because of their religion, as secular because it respects Muslim men’s religious rights and recognizes that they are culturally different from Indian men and women of other religions. Muslim opponents argue that any attempt to introduce Uniform Civil Code, that is equal laws for every human being independent of his or her religion, would reflect majoritarian Hindu sensibilities and ideals. The controversy is not limited to Hindu versus Muslim populations in India. Islamic feminists movement in India, for example claim, that the issue with Muslim Personal Law in India is a historic and on going misinterpretation of Quran. The feminists claim Quran grants Muslim women rights that in practice are routinely denied to them by male Muslim ulema in India. The ‘patriarchal’ interpretations of the Quran on the illiterate Muslim Indian masses is abusive, and they demand that they have a right to read the Quran for themselves and interpret it in a woman-friendly way. India has no legal mechanism to accept or enforce the demands of these Islamic feminists over religious law. Some religious rights granted by Indian concept of secularism, which are claimed as abusive against Indian women, include child marriage, polygamy, unequal inheritance rights of women and men, extrajudicial unilateral divorce rights of Muslim man that are not allowed to a Muslim woman, and subjective nature of shariat courts, ‘‘jamaats’’, ‘‘dar-ul quzat’’ and religious qazis who preside over Islamic family law matters. Goa is the only state in India which has Uniform Civil Code.The Goa Civil Code, also called the Goa Family Law, is the set of civil laws that governs the residents of the Indian state of Goa. In India, as a whole, there are religion-specific civil codes that separately govern adherents of different religions. Goa is an exception to that rule, in that a single secular code/law governs all Goans, irrespective of religion, ethnicity or linguistic affiliation. A Hindu temple in Jaipur, India merging the traditional tiered tower of Hinduism, the pyramid stupa of Buddhism and the dome of Islam. 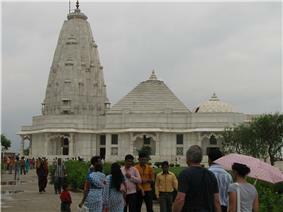 The marble sides are carved with figures of Hindu deities, as well as Christian Saints and Jesus Christ. Writing in the Wall Street Journal, Sadanand Dhume criticises Indian "Secularism" as a fraud and a failure, since it isn't really "secularism" as it is understood in the western world (as separation of religion and state) but more along the lines of religious appeasement. He writes that the flawed understanding of secularism among India's left wing intelligentsia has led Indian politicians to pander to religious leaders and preachers including Zakir Naik, and has led India to take a soft stand against Islamic terrorism, religious militancy and communal disharmony in general. Amartya Sen, the Indian Nobel Laureate, suggests that secularism in the political – as opposed to ecclesiastical – sense requires the separation of the state from any particular religious order. This, claims Sen, can be interpreted in at least two different ways: The first view argues the state be equidistant from all religions – refusing to take sides and having a neutral attitude towards them. The second view insists that the state must not have any relation at all with any religion. In both interpretations, secularism goes against giving any religion a privileged position in the activities of the state. Sen argues that the first form is more suited to India, where there is no demand that the state stay clear of any association with any religious matter whatsoever. Rather what is needed is to make sure that in so far as the state has to deal with different religions and members of different religious communities, there must be a basic symmetry of treatment. Sen does not claim that modern India is symmetric in its treatment or offer any views of whether acceptance of sharia in matters such as child marriage is equivalent to having a neutral attitude towards a religion. Critics of Sen claim that secularism as practiced in India is not the secularism of first or second variety Sen enumerates. ^ "The Constitution (Forty-Second Amendment) Act, 1976". Government of India. Retrieved 1 December 2010. ^ A skewed secularism?" by Christophe Jaffrelot""". Retrieved 27 July 2012. ^ a b c Dhume, Sadanand (20 June 2010). "The Trouble with Dr. Zakir Naik". The Wall Street Journal. ^ Haviland, Charles (5 September 2002). "Battle over India's marriage age". BBC News. ^ Thomas R. Metcalf (2002). A concise history of India. Cambridge University Press. p. 257. 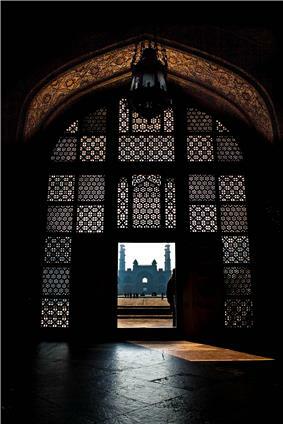 ^ a b Imagining India, by Ronald Inden. Indiana University Press. 2000. p.xii.